This tutorial demonstrates how to implementUser Interactions to handleIntercepted Data	in Decisions. To follow the example the Intercepted Data should already have been created. Intercepted data is stored in the Rule Set Results Folder	. The next step is to create a handler to be able to fix intercepted data and continue theFlow. This example demonstrates how to create an Action	on Intercepted Data	allowing users to fix invalid data and continue the execution of the Flow. 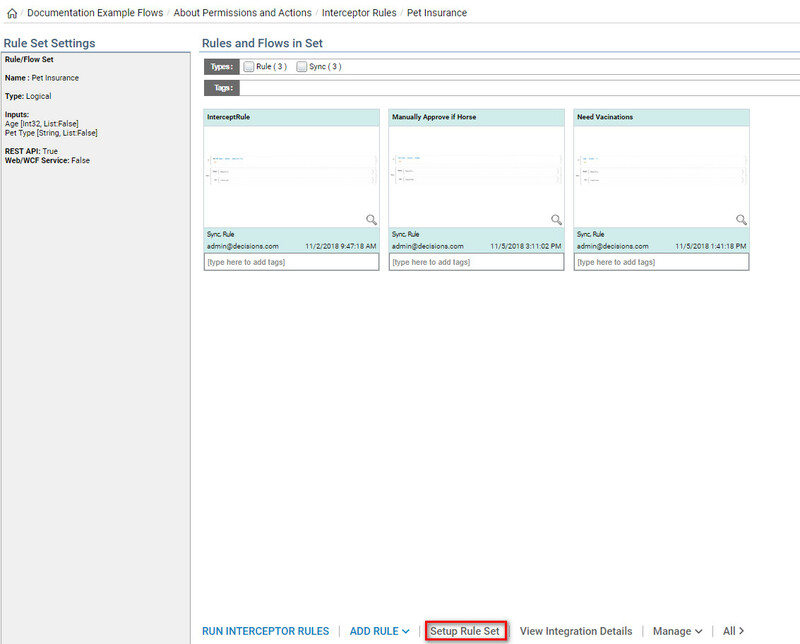 Begin in the Rule Set Folder	by selecting Setup Rule Set	from the Folder Actions Panel. 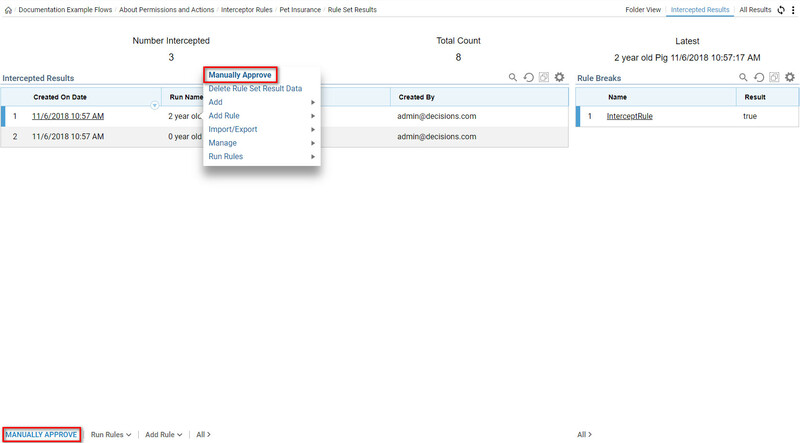 Setup Rule Set properties	and scroll down to the Outcome Options	section and add a new Defined Outcome Path	called, (Manually Approve) . AnyDefined Outcome Path	from a Rule Set	becomes an outcome from Run Rule Set	step in our Process Flow and an Action	on Intercepted Data inRule Set Results Folder	. We click Ok	to saveRule Set Setup and continue. 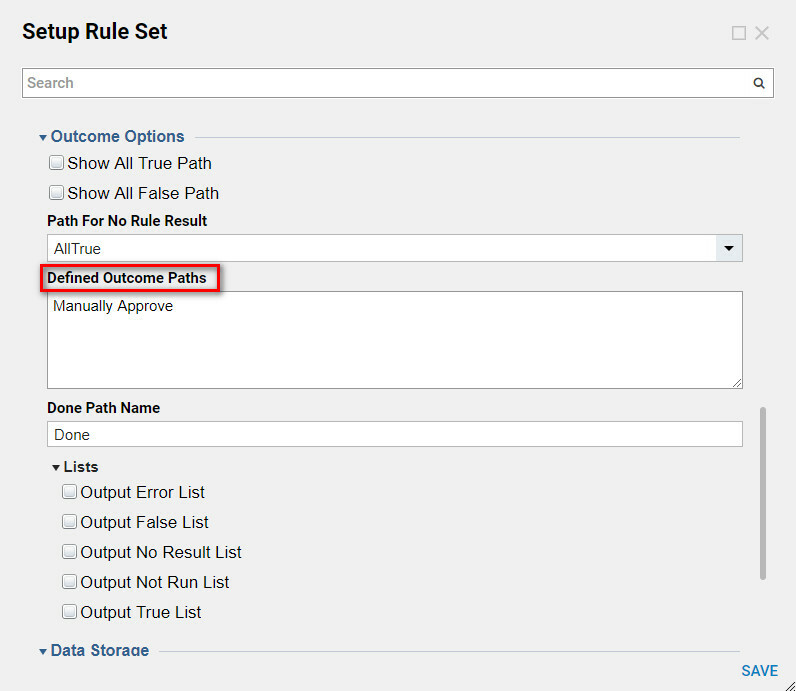 After an Outcome Path is defined the Outcome path will appear as an action in the Rule Set Results Folder. Select an Intercepted Result and select Manually Approve	to complete the Flow. 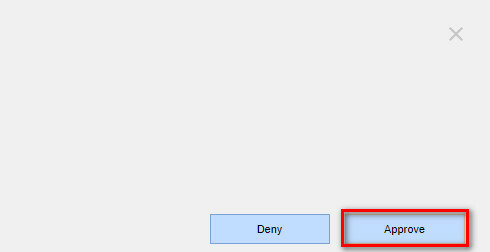 This will open up the Form that allows you to Approve	orDeny	the Intercepted Data. When the Form shows either Approve or Deny the application. This will complete the Main Flow process. After an action is taken to either approve or deny or edit, the flow will continue to process and the Intercepted data will clear out of theRule Set Results Data Folder.